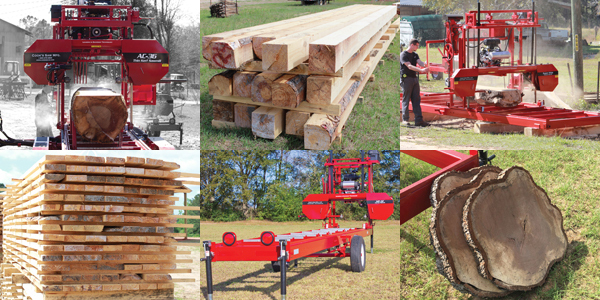 Start producing more lumber than ever before with a Cook's AccuTrac Portable or Stationary Sawmill. High production sawmilling used to be what circle saws were known for. Today, not everyone wants to keep up with half a dozen or more employees nor the liability that circle sawing brings. But people still want the high production that comes along with a powerful machine that can produce straight cut lumber. With a high production bandmill like the AC-36 portable saw mill, you can make more money with less people, less maintenance, less headache, and do it all for less money! And we can help you accomplish this goal with our line of portable logging equipment. We manufacture portable saw mills that will help make you more money. We do more than run our sawmills at a show -- we've made a living with them -- and run them on a full-time operational scale. So if you want to buy from a company who really knows what it takes to run a sawmill operation every day, we can help you. Our line of hydraulic portable sawmills and stationary sawmills have been in production since 1994 and the very first mill we built is still running strong today. We build them heavy duty and we build them to perform, so you not only have a long lasting mill, but a portable sawmill that you can make a living with. We try to use as few specialty parts as possible, so when you do need a part, you can pick it up locally; when you're really in need. Every one of our office staff have been trained to run each of our sawmills, so when you call, there is someone knowledgeable here to help you with your AccuTrac portable sawmill.